Before I dropped everything and went to Portland for a week to attend the International Association of Culinary Professionals Annual Conference, on Thursday morning April 15th I made my way down to the South Street Seaport for NYC Council Speaker Christine Quinn's press conference on bringing a permanent market back to lower Manhattan at the South Street Seaport. Perhaps it was the frequent mention of the the revitalization of the Essex Street Market on the lower east side and the Dining In/Dining out article in the New York Times about Breezy Hill Orchard's Elizabeth Ryan and Fresco del Rancho that Bob Lewis, New York State Department of Agriculture, waved when he spoke but I suddenly had an urge to shop for lunch and groceries at Essex Street. Backed by a coalition of local leaders, elected officials, food advocacy intelligentsia, and regional producers. Quinn spoke about her initiative "New Yorkers 4 Markets" and the incredible job creation opportunity a year round market would bring. Others touched on the recent growth of the neighborhood and its food history, including the fruit and vegetable market during the 1950s, Washington Market, at the World Trade Center site and unfortunate demise of the Fulton St. Fish Market. 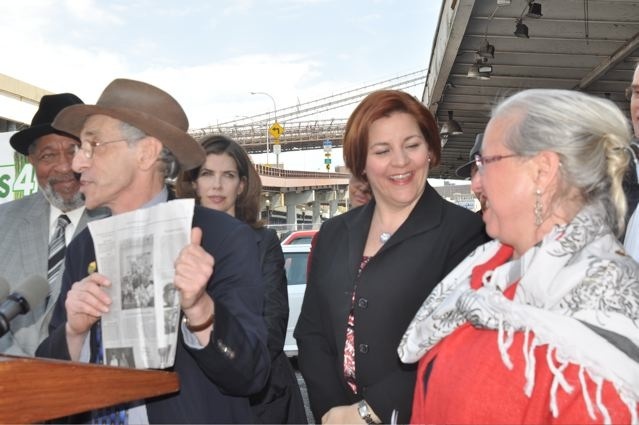 A unique place at the Seaport to showcase local and regional producers, the culinary skills and ethnic diversity of New Yorkers and their food --- and, all to draw millions of tourists and locals alike while increasing tax revenues and jobs. "We want to put people to work", we want to model "Pikes Place Market in Seattle which attracts 8-10 million visitors a year", Quinn rallied. As everyone spoke, I found myself day dreaming. 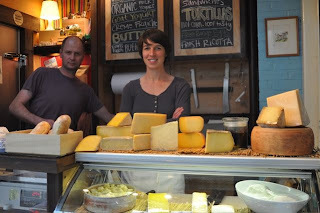 Imagining myself in a crowd of eaters and among dozens of stalls filling a large basket with locally made cheeses made from New York State cows and goats, selecting fresh apples from the Finger Lakes and Peconic scallops and potatoes from Long Island. 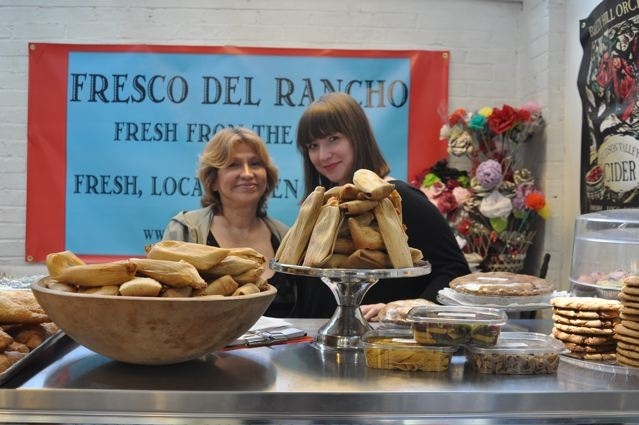 I could even smell of fresh baked bread in my mind's eye. When I caught my wandering off into locavore land, I snapped out of it and found myself back at the press conference in what is now a parking lot in front of an abandoned and depressing building. "Taxi!" "Please take me to Essex and Delancy". Serving as an incubator of sorts for food entrepreneurs, these purveyors all have just one retail outlet and its at Essex Street. 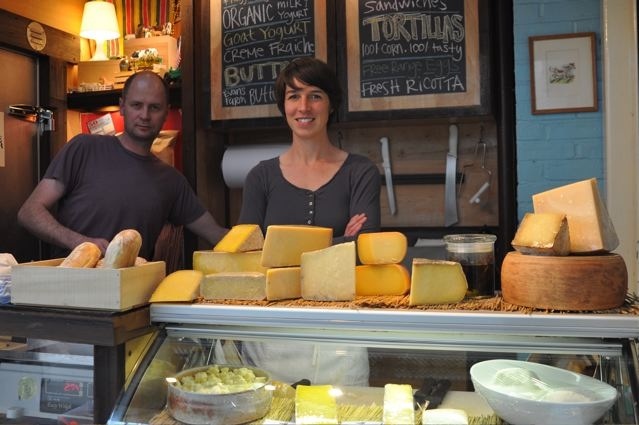 Anne Saxelby has a new location in front aisle of the market and has hand selected some of the best cheeses in the northeast. I went home with a nice piece of Lake's Edge aged goat cheese to go with the bread and cider that I bought and a flyer for an upcoming tour in the Hamptons to Wolffer Estates Winery and Mecox Dairy, of course. 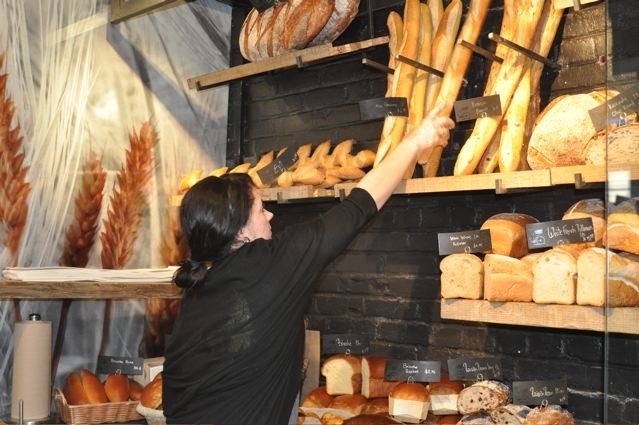 Formerly a wholesale only bakery out of Long Island City serving some of New York's top restaurants Pain D'Avignon has a brand new shop at Essex Street where they sell their artisanal breads. In a few weeks, they will start selling sandwiches and coffee as well. The gorgeous whole grain and French baguettes went really well with the Lake's Edge cheese. 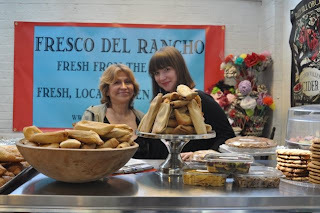 Board member and farmer, Elizabeth Ryan, brings Breezy Hill Orchards together with the Lower East Side Girls Club baking venture at the Essex Street market at Fresco del Rancho just down the aisle from Saxelby Cheese. The girls and Elizabeth serve fresh apples and various flavors of ciders alongside freshly made pies, cupcakes and more. They will have more produce later in the spring and during the summer and fall.